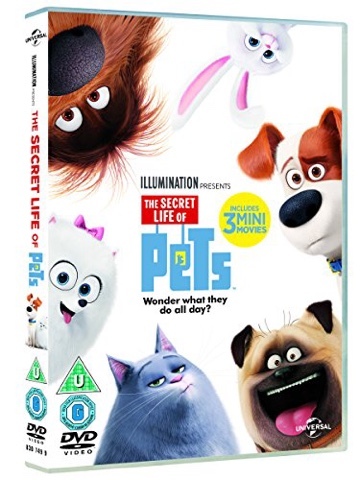 We have one copy of The Secret Life of Pets on DVD to be won! Use the Gleam form below to enter. We have a cat called Princess. I don't currently have any pets , but have had cats , dogs , ducks , chickens , pigeons , and budgies. We have lots of Basset Hounds (pets) and a pigeon that can't fly that lives in the summer house. Unfortunately we don't have any pets. I have one cat and two guinea pigs! Just some tropical fish these days. Had cats growing up. We have 2 Jack Russells, father and son, named Stitch and Lucky. I do, I have one cat called Bellatrix. We don't have any as my daughter is allergic. 2 beautiful cats called Ginny and Percy! I have no pets at the moment. My last pet was a rabbit called Arthur. He was a little sweetie! we have 2 cats at the mo, making it 3 soon!! We have one dog, Roxy, who we adopted last October. Have had newfies in the past would love to have one again. I don't have any pets now but I used to have a border collie mix. No pets unfortunately - would love a cat though. We do have pets, we have a 2 year old cat called Seraphina, a hamster called Talos and a Chinchilla called Artemis. We have a black labrador cross (not sure what the other bit is) called Doni. We have a dog called Oscar. No pets at the moment.